Welcome to Mahalakshmi Airtech Services. Supplier of Air Compressors and Accessories. The company was incorporated in the year 2010 at Nagpur. Our Proficient professionals and Excellent logistics support make us stand apart from also rans. We are backed by Convenient payment options. Goodwill Enterprises and Gupta Energy Private Limited are some of our esteemed clients. We offer a wide assortment of Air Compressor and Pipeline Accessories. Our Air Compressors and Drill Machines are well known for their outstanding performance. Air Compressor and Pipeline Accessories offered by us are best in the industry. Our Reciprocating and Portable Power Air Compressors are extremely reliable. We also provide Pipe Fittings and Modular Aluminum Compressed Air Pipings that are a class apart. 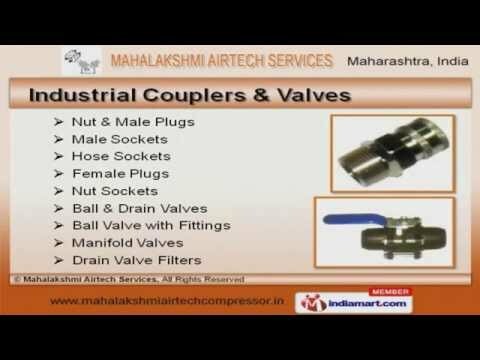 Along with that we offer Industrial Couplers and Valves at industry leading prices.